The Lord is definitely calling us to be aware of the time. He is telling us to seek prophetic messages to help each of us know what we and others are supposed to do in this season. We must not waste any more time in offense, resentment, envy or strife. 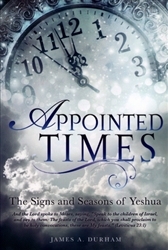 We must see clearly what hour this is in the spiritual realm! We must know what the Lord wants us to do, and then get busy doing it! James Durham has served in ministry for more than 47 years, including 13 years as a pastor and church planter and almost 30 years as an active duty army Chaplain. James retired from the military at the rank of Colonel. In 2010, James and his wife, Gloria, retired from the pastoral ministry and moved to Columbia, South Carolina in order to write, teach seminars around the world, and mentor many spiritual sons and daughters. James is a graduate of Oklahoma State University with a Bachelor’s Degree in Psychology and Perkins School of Theology, Southern Methodist University, Dallas, Texas with a Master’s degree in Theology.